“Hans Richter: Everything Turns–Everything Revolves” will screen the last night of the FramesWorks: Art on Film series at The Jacob Burns Film Center. The curated series running June 12th-26th prides itself on “six great nights of film and conversation.” As part of the Q&A Director, Dave Davidson will be presenting two of Richter’s short films; “Filmstudie” (rescored by The Alloy Orchestra) and “Ghosts Before Breakfast” (rescored by Rob Morsberger). 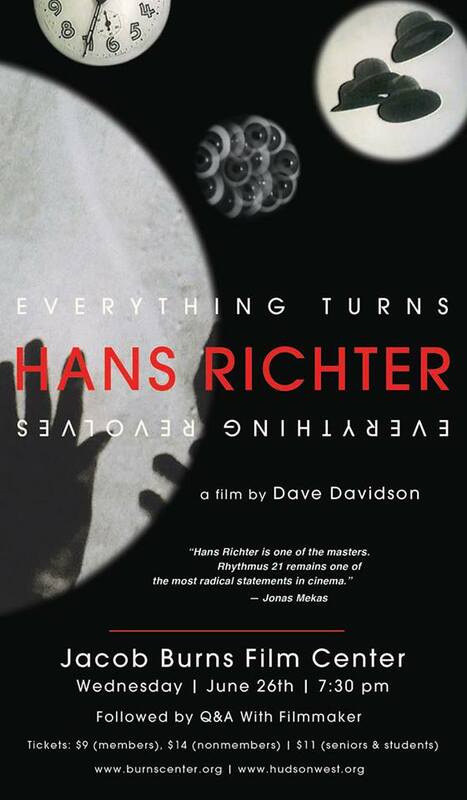 This week the Richter team heads out to LA for the West Coast premiere of the feature documentary “Hans Richter: Everything Turns–Everything Revolves”. The premiere of the film on May 5th, 2013 at the Los Angeles County Museum of Art (LACMA) will launch “Hans Richter: Encounters”, the first major U.S. retrospective of Richter’s art and films. After the premiere the film will live on within the exhibition as twenty minutes of select scenes will run constantly as an installation within the exhibition. For tickets and information about the exhibit check out LACMA’s website.